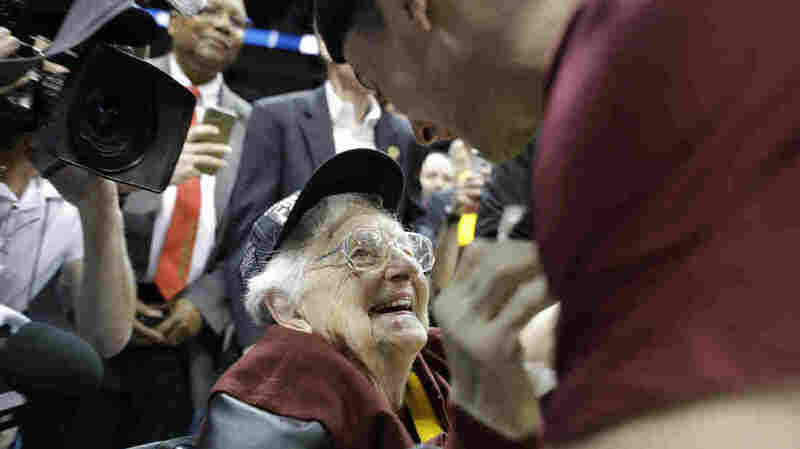 Sister Jean: Nun Friends Celebrate Loyola's March Madness Run "There's our girl!" says Sister Peggy Geraghty as the camera pans to Sister Jean Dolores-Schmidt, the 98-year-old Loyola-Chicago men's basketball team chaplain. Chaplain Sister Jean Dolores Schmidt speaks with Loyola-Chicago guard Ben Richardson after a regional final NCAA college basketball tournament game Saturday. She and two other retired Sisters of the Charity of Blessed Virgin Mary are focused on the flat screen television in their apartment on the northwest side of Chicago, about nine miles from the campus that has become the center of the city's attention — as much for a charismatic, feisty nun as the basketball team. "There's our girl!" said Sister Peggy Geraghty as the camera pans to a friend they've known for 50 years. Sister Jean Dolores-Schmidt, a fellow BVM and the chaplain for Loyola's men's basketball team, is greeting well-wishers at the game in Atlanta. Jean Dolores as they call her, has become the runaway star of the Ramblers' run, which thanks to a 69-68 win over Nevada has extended to the Elite Eight, and Saturday to the Final Four after their victory over Kansas State. 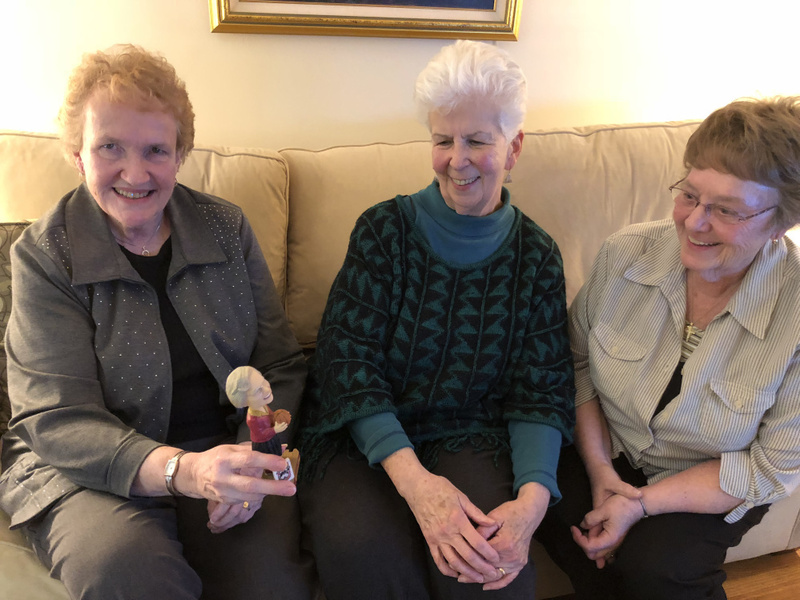 Sisters Pat Geraghty, Mary Fran McLaughlin and Diane O'Donnell with a Sister Jean bobblehead. Geraghty, McLaughlin and Sister Diane O'Donnell can't believe they are watching their friend become an "international star." Laughlin and O'Donnell are sitting on a couch, with Schmidt's bobblehead on the coffee table in front of them. Geraghty pages through the Chicago Tribune, pointing out the full-page ad from Loyola featuring Schmidt's shoes. "No one in our community has done anything like this, but this is really unique," McLaughlin says. "It's so nice for us, because she's just one of us!" Even in retirement, BVM sisters live together, support one another and share meals together. This means helping the 98-year-old Schmidt to her doctor's appointments — she broke her hip in November — and taking her grocery shopping. The three sisters don't follow basketball too closely, and though they have advice for the Ramblers, particularly on rebounding, they ask at one point about what constitutes an offensive foul. They continue to be active in ministry — serving as literacy tutors, helping at the nearby parish and working with Catholic schools and homes for children. Their days are usually too busy to pay attention to basketball but, for Sister Jean, they've tuned in. Halfway through the game, McLaughlin wonders how Loyola's players are able to keep up with their classes while also dealing with the demands of basketball. "Jean will be telling them to study!" O'Donnell said. Schmidt lives in an apartment in a residence hall on Loyola's campus. The hip injury has hampered her, so she hasn't been able to lead prayer groups as much as she used to. But she is used to dealing with changes. Loyola's connection to the BVMs goes back to 1992. Mundelein College, a women-only college, shared a neighborhood with Loyola and was facing dwindling enrollment and skyrocketing costs. It folded into Loyola, and several sisters who had worked as professors and administrators at Mundelein moved to Loyola. It wasn't easy for the sisters to say goodbye to the college they founded in 1929, but Schmidt rolled with it. "She didn't cry about it. She moved on and took the next job," O'Donnell said. At Mundelein, Sister Jean ran the weekend college, served as a dean, and helped run the curriculum for young aspiring sisters. At Loyola, she's worked in residence halls and with the basketball team. And all of those different jobs means she's influenced generations of students. Geraghty, O'Donnell and McLaughlin love being around her on campus to see how she makes everyone feel special. "If you walk around campus with her, she remembers everyone," Geraghty says. "She makes everyone feel like they are her favorite." The three roommates have worked all over the country as educators and in administrations at different schools and understand just how important Schmidt's ministry is on Loyola's campus. "If you're on faculty at a school, the kids notice when you're at the games. It means so much to them, and they thank you the next day," McLaughlin said. O'Donnell says the community aspect of their lives as sisters has spilled into how Schmidt guides the team. Loyola plays an unselfish style, passing the ball with precision. Different players have taken key shots in every one of their thrillers. "She has defined what a team really is. Everybody works together. And it's so characteristic of what we are," O'Donnell says. "Everyone works together and no one gets too big." "We don't need anyone to get too fancy pants around us!" McLaughlin adds. As the game nears its end — the one they wanted — the sisters allow their minds to wander toward a potential conflict that once seemed, even to them, impossible. "It's on Holy Saturday," Geraghty says, referring the the day before Easter, when Catholic churches hold services at night in anticipation of Easter. "The Final Four ... it's on Holy Saturday, but it's only at 6." Now, with Loyola only one win away from a trip to San Antonio, they are allowing themselves to dream not only for them, but for their friend Sister Jean.